Kara Knight can't wait to leave her hometown for the promise of nursing school and a fresh start on her future--leaving behind an over protective mother, a broken heart and painful memories. However, twenty-five miles away, the brother she doesn't know is determined to be reunited with the sister he cannot forget. Kara is abducted and thrown into her obsessive captor's delusional world. As the past she thought she knew unravels around her, Kara struggles to make sense of the memories that come creeping back, threatening her sanity and her safety. Meanwhile, Kara's mother races against time to save the daughter she fears she will lose when a long-held secret is revealed. The hours tick away as Roland plays out his plan--to take Kara with him into death at the exact moment of their birth, never to be separated again. TRACES OF KARA is an action packed, pulse pounding psychological thriller/suspense novel that features a determined killer who slowly loses his grip on reality as his carefully detailed plan starts to fall apart and a heroine determined to move forward with her life who now must reconcile everything she believed to be true about her family with the reality of their tragic past. 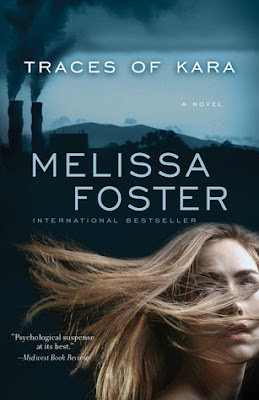 Melissa Foster is the bestselling, award-winning author of three novels, Megan’s Way, Chasing Amanda, and Come Back to Me. She is the founder of the Women’s Nest, a social and support community for women, the World Literary Cafe, and Fostering Success. Melissa hosts an annual Aspiring Authors contest for children, she's written a column featured in Women Business Owners Magazine, and has painted and donated several murals to The Hospital for Sick Children in Washington, DC. 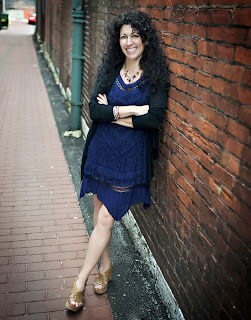 Melissa is currently working on her next novel, and lives in Maryland with her family. Melissa's interests include her family, reading, writing, painting, friends, helping women see the positive side of life, and visiting Cape Cod. Oh gosh, I cry at so many songs. Probably Hold On by Spitalfield. A former boyfriend used to play it for me, and has since passed away. So now when I hear it, tears follow. I don't ever remember crying from a song :/ I don't listen to much music though, I prefer books. I seriously can't remember the songs title but I know it was while watching the Australian version of the voice. This young boy sang with such a strong, beautiful voice it made me cry. A Thousand Years - Christina Perri... Love it! I can't think of one. Usually songs don't make me cry, but books and movies do often. songs usually don''t make me cry. so none. Paramore - we are broken.